Returning to CES with new technologies that aim to enhance people's lives, Honda will showcase a variety of mobility, robotics, energy management, and connected concepts at CES 2019, January 8-11, 2019, that have the potential to create a cleaner, safer, and more convenient world. The Honda Autonomous Work Vehicle is a prototype off-road vehicle that was designed by Honda R&D Americas to bring efficiencies and increased safety to public, commercial, and consumer enterprises, such as construction, agriculture, search and rescue and firefighting. The company will feature demonstrations of in-vehicle connected services in the all-new 2019 Honda Passport, and provide a first look at real-world testing of the off-road Honda Autonomous Work Vehicle, a new category of vehicle dreamed up by Honda engineers. Honda’s CES exhibit highlights the company’s technology prowess in a broad range of areas and offers a vision of collaboration with business and technology partners to create new categories of products. Honda encourages potential collaboration partners to visit its CES booth #7900 in North Hall at the Las Vegas Convention Center. Honda Innovations, the Silicon Valley arm of Honda R&D, will debut new collaborations with startups and major brand partners through its open innovation programs, Honda Developer Studio and Honda Xcelerator. Both serve as catalysts to discover and experiment with new technologies and concepts, further emphasizing Honda’s commitment to open innovation. Honda will show real-world testing scenarios of the Honda Autonomous Work Vehicle, a prototype off-road vehicle that is a combination of Honda’s all-terrain vehicle (ATV) and emerging advanced autonomous technology. It was designed by Honda R&D Americas to bring efficiencies and increased safety to public, commercial, and consumer enterprises, such as construction, agriculture, search and rescue and firefighting. The Autonomous Work Vehicle is based on Honda’s proven ATV chassis, which has a 30-year history of accessing hard-to-reach locations with its rugged four-wheel drive system. The vehicle features GPS and sensor-based autonomy capable of guiding the unit in almost any environment; a rail accessory mount system for limitless accessories and attachments; and onboard power plug-ins. 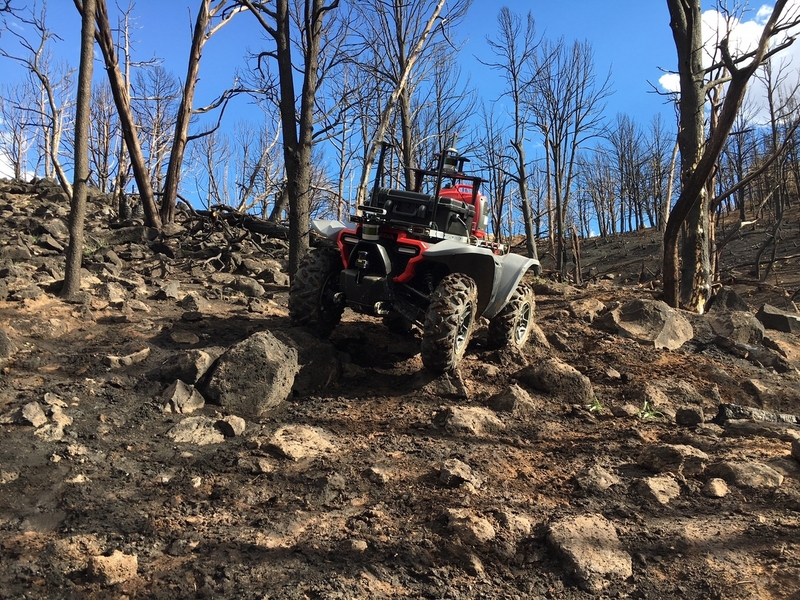 Since the Autonomous Work Vehicle’s debut at CES 2018 under the name 3E-D18, Honda has worked with partners to beta-test and evaluate use cases in a broad array of work environments, including a large-scale solar operations company in North Carolina, a wildland firefighting division in Colorado, and an agricultural and environmental sciences college in California. As R&D efforts continue on the Autonomous Work Vehicle, Honda seeks to collaborate with partners to develop accessories and attachments that will expand the machine’s potential uses, businesses that may have a need for the vehicle, and autonomy technology and sensor developers to further improve the platform’s off-road autonomy. Interested businesses and technology partners may email AWV@hra.com. SAFE SWARM™ is a concept that demonstrates Honda’s dream to realize a collision-free society through safe and smooth traffic flow using connected car technologies. Inspired by nature, Honda R&D developed this unique SAFE SWARM™ concept with the goal of enabling vehicles to wirelessly communicate and move fluidly and efficiently without a collision like a school of fish. Using Vehicle-to-Everything (V2X) technology, Honda SAFE SWARM™ allows vehicles to communicate with surrounding vehicles and share key information such as location and speed. With this information, along with the sensor suite on the vehicle, the driver or automated vehicle systems can determine the safest course of action in merging with traffic or avoiding a road hazard. Ultimately, Honda believes that connecting all road users will create a safer transportation environment, mitigating and eventually eliminating all traffic fatalities. Honda’s SAFE SWARM™ concept can improve traffic flow by taking information from vehicles ahead to prevent potential traffic snarls, take early braking action to help avoid a wave of emergency braking, or to change lanes if needed. It does this through an on-board system with V2X communication, as well as the existing sensors on the vehicle and even sensors in the infrastructure. Rounding out the Honda CES robotics display is Honda Omni Traction Drive System, a mechanism that enables omni-directional mobility. Originated from Honda robotics research, Honda Omni Traction Drive is the driving system of UNI-CUB, Honda’s self-balancing personal mobility device. Since the mechanism can be applied to a variety of mobility products and devices, Honda is pursuing collaborations with partners seeking to add new value in mobility and transportation. Honda’s first collaboration is with Japan-based Nidec-Shimpo Corporation, which licensed the Honda Omni Traction Drive System for its S-CART automated guided vehicle. Honda will debut its Wireless Vehicle-to-Grid (V2G), a bi-directional energy management system that has the potential to reduce CO2 and create new value for customers. The growing popularity of electric vehicles (EVs) has the potential to strain the power grid, leading to the increased use of non-renewable energy sources to meet demand, which will result in greater carbon emissions. Recognizing that batteries in vehicles also can be used as storage to help balance supply and demand, Honda EV owners will be able to participate in the V2G program and receive compensation from utility operators who benefit from the use of Honda EVs to balance the grid’s energy supply. Honda Dream Drive: Driver demonstrates the expansion of Honda’s in-vehicle payment technology concept, first introduced at CES 2017. It enables customers to make restaurant reservations, pay for goods and services like fuel, movie tickets and parking, and share the driver’s location – all from Honda’s connected car mobile wallet. Honda Dream Drive: Passengeroffers mixed reality games, movies and travel applications, as well as control of radio and cabin features – all from the passenger’s mobile device. The more robust Honda Dream Drive platform will also debut a concept rewards system that allows customers to earn rewards. Honda Dream Drive experiences have been developed in collaboration with industry leaders in retail and entertainment and will be announced at CES 2019. As Honda’s liaison to startup ecosystems in the U.S. and globally, Honda Xcelerator will highlight its collaborations with startups Noveto Systems and Perceptive Automata to develop driver assistive technologies. Honda Xcelerator and Noveto will demonstrate 3D audio technology leveraging Noveto Smart Audio™ technology – developed independently by Noveto – that sends targeted audio signals to each of the user’s ears enabling intuitive audible cues to be delivered to the driver without requiring them to take their eyes off the road. This technology will enhance the driver’s spatial awareness of their surrounding environment by warning the driver of hard-to-see objects detected by on-board sensors, as well as delivering a more intuitive navigation experience.